The gas giant now has 79 confirmed moons, including a new “oddball” one. 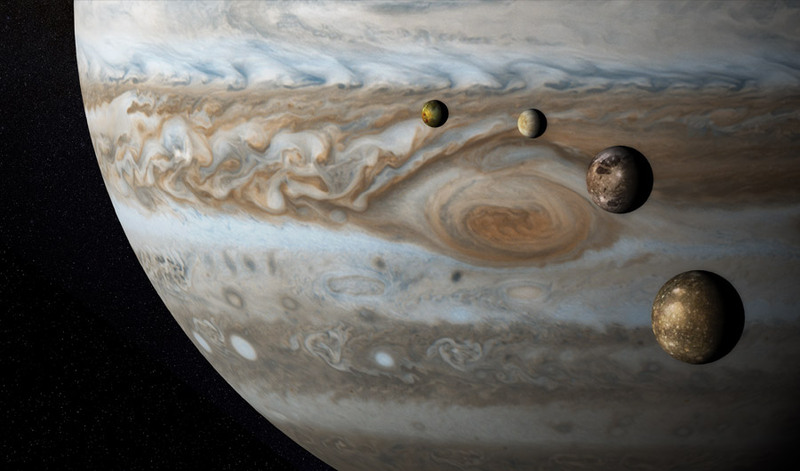 Jupiter with moons Io, Europa, Ganymede, and Callisto. (Inside Science) -- Trivia teams across the country will have to update their astronomy notes. Today, a team of astronomers announced the discovery of 10 newly described moons orbiting Jupiter -- including one “oddball” -- bringing the giant planet’s retinue up to a whopping 79. The astronomers were led by Scott Sheppard from the Carnegie Institute of Science in Washington, D.C. In 2017, while searching the night sky for the mysterious Planet X -- a hypothetical planet far beyond the orbit of Pluto -- Sheppard decided to take a detour toward nearby Jupiter. "Jupiter happened to be up in the sky and we hadn't searched that area of sky yet,” he said. “We decided to kill two birds with one stone and look for Jupiter moons at the same time as looking for very distant objects." This worked because both distant moons and distant planets would show up as faint points of light, which the telescope could track. Ultimately, Sheppard’s team was able to find a dozen moons. Two were announced in 2017, with the other 10 being formally announced now. Two of these newly described moons orbit close to the planet in the “prograde” group, which orbits in the same direction that the planet rotates on its axis, while another seven are found in the retrograde group -- a collection of more distant bodies that orbit the gas giant in the opposite direction. The “oddball” is also found with the retrograde moons, but acts quite differently. The moon is nicknamed Valetudo, after the Roman goddess of health and hygiene, who was the god Jupiter’s great-granddaughter. It is only about a kilometer across, making it Jupiter’s smallest known moon. But what makes it truly weird is that while it’s found near the retrograde moons, it’s going the other way, like a driver heading the wrong way down the interstate. This means the little moon is likely headed for a violent collision sooner or later. Sheppard’s team is running simulations to see just how long Valetudo can continue its precarious orbit without incident. “Within a billion-year timespan, it probably won't last,” said Sheppard. Beyond keeping trivia teams on their toes, the discovery of Valetudo and the new retrograde moons is also interesting because it could help us understand why retrograde moons exist in the first place. To put it simply, moons don’t form going backwards, explained Imke de Pater, an astronomer at the University of California, Berkeley who was not involved in the new discovery. Instead, it’s thought that they might have been comets, asteroids or planetoids that were captured by the planet’s gravity well after the solar system had formed. Collisions with gas, dust or other moons may have helped slow them into stable orbits. All gas giants in our solar system have retrograde moons and by finding these new ones, along with Valetudo, Sheppard’s team has given scientists more data points to work with. Though Sheppard’s team was the first to find these new moons, they did not work alone. Several other teams of experts, astronomers and observatories helped them track the objects and validated their findings, including the Lowell Observatory in Arizona, the University of Hawaii and NASA’s Jet Propulsion Laboratory. Observations were published by the International Astronomical Union, a worldwide group of astronomers and the de facto bottom line on astronomical decisions. They were the people who demoted Pluto to its current dwarf planet status back in 2006. Valetudo is the only newly discovered moon to have a proposed name so far. Though Jupiter’s now-79 moons firmly cements its status as the planet with the most moons in the solar system (Saturn comes next with 62), Sheppard said scientists are probably not done finding new ones yet. "We think there's probably many more of these out there,” he said.